The Scrum Gathering this week is at hotel@MIT in Cambridge. I'm sitting in on a Certified ScrumMaster training course led by Ken Schwaber. We plan on doing one together at PatientKeeper in the Boston area in August. This would be a great opportunity to train under the two founders of Scrum. But I digress. In the hotel lobby, everyone walks by the robot Attila II. This was built by a company which is now part of iRobot based on Rodney Brooks subsumption architecture. The progenitor of iRobot leased space from me in my object database laboratory adjacent to the MIT campus in the early 1990's. The ancestors of Attila II would come into my office and try to chase me down using IR sensing. This stimulated my thinking on development process just before I left to join Easel Corporation where we invented Scrum. The amazing thing is that the Scrum trainers and trainees are walking by Attila II without realizing it is the reason that the Scrum process does such a great job of self-organizing teams, work, and architectures. 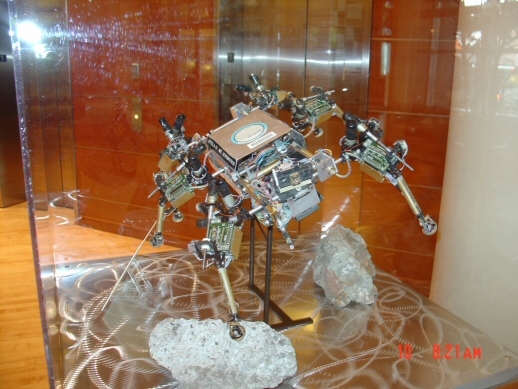 Attila II has multiple automous processors on it legs and back. They are in continuous communication with each other and follow a few simply rules enforced by the processors on its head and backbone. With this "face to face" communication by "autonomous agents" following simple rules, the father of Attila was able to learn to walk after insertion of a blank neural network chip in about five minutes. The sons and daughters of Attila II are exploring Mars. The face to face communication in the daily Scrum meeting triggers the collective neural network of the team members minds. Following the simple rules of Scrum and communicating what just happened, what will happen, and what blocks got in the way, the team self-organizes to walk around impediments and if they track and manage blocks carefully, the team generates a continuous quality improvement plan that transforms an organization. Thank you Attila II, progenitor of Scrum! And congratulations to Rodney Brooks and his team. They never imagined they would change the face of global software development.